Today I brought my daughter to the fracture clinic at our local children’s hospital for a final check up on her arm (she broke her elbow in September). Her appointment was 11:15 and when I called to see if I could change it to later in the day to better work in my schedule, the receptionist explained that her doctor only kept office hours until noon. If you’ve ever been to the fracture clinic, you will not be surprised to know that the clinic was packed when we got there and that we did not even get called into the doctor’s office until 12:30. I didn’t mind – this was a shorter wait than we’ve had in the past, and I felt for the doctor and the pressure on his time. As I walked out and saw that there were still a handful of people left in the waiting room I realized that there was no way this doctor was going to be done seeing his patients until at least 1:00 or 1:30 – over an hour after his “office hours” were supposed to be done. I’m guessing I don’t even have to explain what I mean by this. 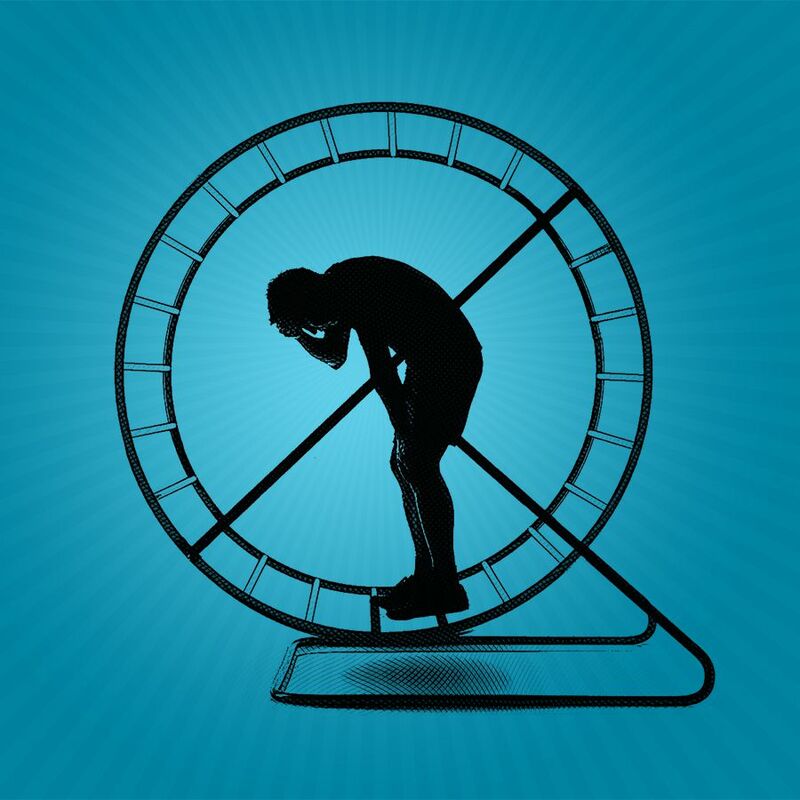 Hamster wheels have become a common analogy for the way we often feel like we live our lives – running and running and running and not really getting anywhere. We run from work to home to school to kids’ activities to the gym to the grocery store and back to pick up the kids again. We are weary and exhausted from all our effort, but we don’t stop running until, like a hamster, we collapse in a corner to sleep – until we get up to run again. Perhaps we wonder what choice we have. After all, what would all of us in that waiting room have done if the doctor came out at noon and said “Sorry – I’m done for the day”? Our cultural expectation is that we will have our needs met and our appointments kept. If we keep running, other people should keep running , too. Jesus, however, did not live this way. This is interesting because if anyone had reason to “run on a wheel” it was definitely Jesus. This wasn’t an era with modern medical help and for many people at this time with illnesses and disabilities he was their only chance for healing. If Jesus kept office hours, I have no doubt that he never would have had enough appointment slots. I am certain his waiting room would have always been full. I guarantee that he could have worked through every lunch and coffee break and civic holiday. I picture people glaring angrily at his disciples/receptionists as they ask: “We’ve been here an hour already. Do you have any idea how much longer this will be?” There would have always been more that he could do. Let me say it clearly: I believe God has something better for us than a hamster wheel. Jesus said that he came so that we could have life and have it to the full. I do not believe “full” meant a blocked calendar and a mini van with good gas mileage. I think “full” looks a lot more like “spacious.” I believe Jesus wants to offer us a life with space for rest and afternoons at the park and naps and leisurely walks and prayer and suppers at the table and the gift of being available. I believe he invites us to say “no thank-you” to the hamster wheel, so that we can really live. That’s why, if Jesus kept office hours, I think he would have taken a lunch break (remember the feeding of the 5000?). I think he would have inserted slots in his agenda for time with His Father (“I know it’s busy, Pete, but that time slot is non-negotiable”). I think he would have made people angry sometimes when he declared he was done for the day even if there were more people waiting. I think he would have taken his vacation days. Listen, I’m thankful that my doctor didn’t make me wait any longer to treat my daughter. But I also hope he’s not too tired tonight. I hope if there was someone waiting for him for dinner that he made it on time, and that he got to sit and listen slowly to any story someone who loved him wanted to share. I hope that his week will be full of times when he gets off the wheel. I hope he knows I wish this for him, even as I wish it for myself – and for you. I feel this very strongly. I am sort of on call 24/7 for work sometimes, and it’s hard to have a life. One never knows when the boss will call with a problem with his phone on the weekend, or when an “emergency” will require off hours work. My grandfather had one thing right. He spent most of his adult life in India, and there he learned to take a nap break in the middle of the hot afternoons. He did that for the rest of his life, and he lived to 92. I think our society needs an afternoon nap break, or something similar. A time when one can break away and relax, or nap, or read, or pray, that is respected and honoured. We would be better for this. I know it would make my life a lot better. I remember that keeping Sundays for family was one reason to block Sunday shopping back when I was a youth. I keep thinking that we need more time where we can just be, one day, one hour, one something, where folks respect rest. I know, I am asking too much.